The GTIL2-LCD Grid Tie Power Inverter with LCD display is the world’s most technologically advanced inverter for use in utility-interactive applications. This integrated system maximizes energy harvest, increases system reliability, and implifies design, installation and management. You can use this 2nd generation GTIL2-LCD grid tie inverter with Solar Panel [SUN] or Battery [BAT] (DC), Wind turbine [WDL] (DC) and Wind turbine 3 phase [WAL] (AC) input type with configurable 10-30 / 22-60 / 45-90 V input voltage range. The output voltage is pure sine wave auto selected AC 110 / 220 V and 50 / 60 Hz with possible 1000 / 2000 W output power version. Supports it limiter for control the amount of power, dump load controller and resistor for the wind turbine and WiFi plug module for online monitoring. The small type solar and wind grid tie power inverter can obtain the solar energy from solar panel (DC) and wind turbine (DC or AC), and can tie to the grid through its output cables with no extra equipment. The installation is very convenient and reliable. We call the system combining with small solar grid tie inverter and solar panels as SGPV. The system includes solar panels and small type grid tie inverter and installation kit. Solar panels can be mono silicon, polygon silicon, non-crystal film or any other material that can transform solar energy to electric energy. The power of grid tie inverter should be matched to the power of solar panels connected. So the power of SGPV is defined by its solar panels, it can be standardization according to the actual using. The inverter can be connected to any outlets of utility grid at house. The small grid tie inverter monitors the volume, frequency and phase of the home utility grid, then produce pure sine wave AC power that the frequency and phase are as same as the grid's, and the volume is a bit higher than the grid's, then according to the current controlled PWM, to control the output power to the grid. The small grid tie inverter just puts out power when the home grid is on. When the sun shines, the PV panel will produces DC voltage, and the grid tie inverter will change the DC voltage to AC voltage and puts out power to the home grid. When the total power of electric apparatus that are using in the house is larger than the output power of the inverters, these power from the inverters will be consumed in the house, this will slow down the power meter, otherwise, the difference of the output power of the inverter between the total used power of the apparatus will go out from the house to the out grid. We call the system combining with small grid tie inverter and wind turbine as SGWT. The system includes wind turbine and small grid tie inverter and installation kit, and some SGWT also will include controller, dump load resistor. When the wind turbine is rotating, and the output of the voltage is in the range of the rated input voltage of the inverter, the wind turbine will produces power, and the grid tie inverter will change the power from wind turbine to the home grid. When the total power of electric apparatus that are using in the house is larger than the output power of the inverters, these power from the inverters will be consumed in the house, this will slow down the power meter, otherwise, the difference of the output power of the inverter between the total used power of the apparatus will go out from the house to the out grid. There are many advantages of SGPV compare with the traditional grid tie power system. Low cost and easy installation - SGPV can make full use of all types of buildings’ surface that face to the sun in the city as well as fast and easy installation of solar modules and grid tie inverter. It just needs very low maintenance costs. Free combination - SGPV can be used as a separate grid tie system and can be setup as a large solar array with many of them. The quantity of SGPV in the array is just according to your desire. If you are planning to install a grid-tie PV system, in a general way, the solar array and inverter need to be carefully matched to ensure that the inverter’s voltage and power limits are not exceeded. When you want to increase more solar panels, and if the total power of the solar panels exceeds the allocation grid inverter, it is necessary to increase the cost of a grid inverter. Combination of SGPV does not interact - The traditional solar grid tie system, they offer units ranging in high power output and these units are modular so you can have multiple units operating in parallel for large solar arrays. Although, the traditional grid inverter has MPPT feature (Maximum Power Point Tracking), but the maximum power point is according to the entire series in terms of solar panels array, if the performance of a piece of solar panels in the system, for some reason, such as leaves, bird droppings, dust, shadow, etc. and degrades, the performance of the entire solar power system will decrease. SGPV has no such disadvantage. If the performance of a piece of solar panels in the system degrades, this just effects this piece itself, will not affect other SGPV in the system. Improving the efficiency of the entire solar power system – In traditional grid tie system, the solar panels are connected in series, so the MPPT of the inverter is according to the total panels in series, not to every panel, but there is difference between every panel, so not every panel is working at the maximum power, this will reduce the total power of these panel in series. But SGPV has no such disadvantage. Because every inverter of SGPV has MPPT function, so every panel is working at the maximum power, this will increase the efficiency of the entire system. Low power consumption – Most of the parts in the small grid-tie inverter are digital ICs and low power MCU, so the power consumption of it is low, though the quantity of grid tie inverters is increased, but this will not increase the power consumption much of the entire system. The Inverter display can show many information, the main interface of the display and the icons explainations are show above. Nice LCD Display showing different parameters vivid and enable varity settings. Set Menu: Choose the set menu icon on the main screen interface, click the confirm button to enter into the interface show below. In this interface can set the LCD backlight always on or auto turn off backlight after 3 minutes no action. Battery Discharge Current Mode And Battery Discharge Power Mode see below. Grid Waveform: This interface will show the real time grid waveform. The grid voltage and frequency also will show in this interface. Energy Menu: The energy interface will show the power generation curve everyday. Today KWH and Total KWH are also show in this page. Power View: In this interface the display shows real time power, PV input voltage, inside temperature, date and time. Clock And Date Setting: Set the clock and date in this page, save the setting before exit. Why we produced the Grid Tie Inverter with Limiter? It is in response to the overwhelming clamor from our customers for a product that can control the amount of power that the grid tie inverters (GTI) can generate so that the amount of excess power produced by the solar panels are reduced to insignificant levels, if not eliminated - because in some countries, the producer pays for the excess power it gives to the distribution grid. This is because the electric power meters (the one provided by the electricity provider in the area) are not aware of the direction of power flow. In other words it only adds even if power is exported to the grid, thus, the consumers will be charged for power even if it is given to the grid, and this is the problem. This problem solved this 2nd generation grid tie inverter with limiter. With the 2nd generation GTIL, we integrated the limit function inside the GTI - we call this internal limiter. In this way, no additional limiter module is needed, reduced customer’s cost, more easier for installation. But in case customer install inverter far away from the main circuit breaker, we also enable the 2nd GTIL work with stand-alone limiter, we call this-external limiter. For sure, the inverter can work under normal Grid tie - no limit mode, just set on the nice LCD and save your setting. 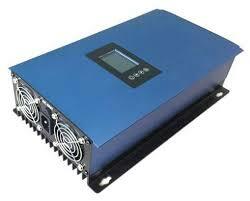 Summary if you do not want to sell electric power, you will need a limiter type inverter. The Grid Tie inverter converts DC power produced by Solar Panels to AC, connects to the grid and feed all of the power available from the panels to the AC load. All excess power that is not needed by the load is then exported to the Grid. If the Grid fails, then the Grid Tie Inverter will turn off. When the Grid comes back on line. The Grid Tie Inverter will again supply power to the load and any excess power is exported to the Grid again. If the Solar Panel is producing less power and the GTI cannot deliver all the power needed by the load, then power will be supplemented by the Grid. Power Meters (Except smart meter) are not aware of the direction of Power flow. The user then pays for the power exported and delivered by the Grid. The Grid Tie Inverter with Limiter delivers only the power needed by the load and prevents delivering excess power hence avoids excess power in going back to the Grid. The heart of the Grid Tie Inverter with Limiter is the Limiter Module (LM). The LM continuously sampled the power needed by the load through the current sensor connected after the Main Circuit Breaker. The LM then will process the signal. It then sends signal to Grid Tie Inverter how much power to deliver to the load in real time. The user, after installing and connecting the GTIL correctly, need not do anything and the unit will do its work automatically. Pls make your setting on the LCD and save it, details setting operation, pls read the GTI manual. This installation is not require an additional limiter module, installation is much easier. Clamp the current sensor cable to the hot wire to measure the current, the internal limiter will auto detect the load power and control the inverter output power, excess power will be well controlled. External protective device including dc and ac SPD (Surge protection device), DC and AC breaker, etc. is recommended to installed in the system. New upgraded firmware enable battery or solar limiter current and power model. User can set the maximum output power of inverter, this can make the inverter work at cooler contition as user want and extend the lifespan of the inverter. User can set kick in/off voltage of the inverter which can flexible using with battery bank depend on users mind and can prevent battery bank from over discharged. Optional, but can order only together with inverter, connected by RS-232 with RS-485 protocol for Web (http://shinemonitor.com/index_en.html) and Mobile Phone App (http://shinemonitor.com/appDownloadEn.html#iossmartclient) online monitoring. support network with hidden SSID. Why to choose GTIL2-LCD grid tie inverter? Advanced patented 2nd generation technology, MPPT efficiency is higher. High-quality imported components, more stable quality, lower failure rate. Significantly longer life, more than 10 years. Much better output waveform compare with similiar GTI. Combination of SGPV and SGWT does not interact. Improving the efficiency of the entire solar or wind power system. Directly connect to three phase wind turbine (WAL). Build in dump load function (only by wind turbine). Build in Limiter (internal type).